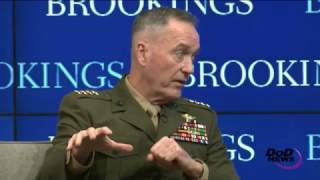 Marine Corps Gen. Joseph F. Dunford, Jr.
Countering the threats posed by Russia, China, Iran and North Korea -- and countering violent extremism -- is still the correct way to benchmark what the Defense Department must do to prepare the joint force, the chairman of the Joint Chiefs of Staff said at the Brookings Institution today. “What they seek to do in all of that is to undermine the credibility of our ability to meet our alliance commitments to NATO and then [operating against] the cohesion of the NATO alliance would be would be an objective of Russian activity,” he said. 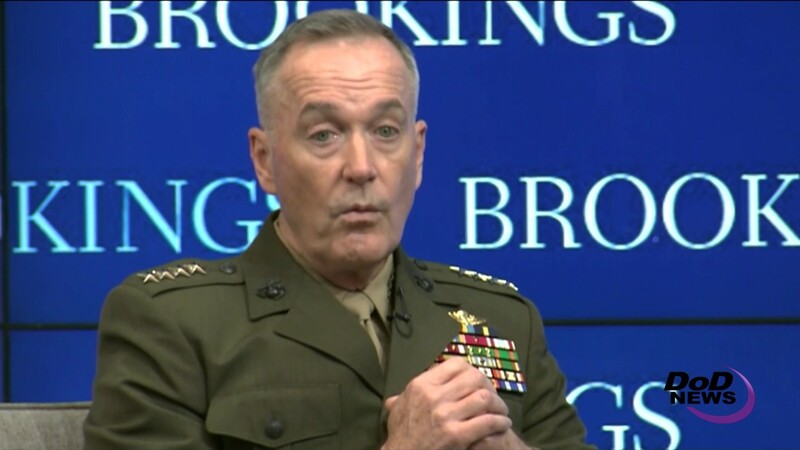 Dunford reiterated U.S. support for NATO and said the United States is fully prepared to meet Article 5 commitments to NATO allies -- an attack on one nation is an attack on all. He also reiterated his earlier statements that NATO nations need to meet their agreed-upon goal of spending 2 percent of gross domestic product on defense. Only five nations do so now. It is also important that the alliance continue to transform, “to be relevant for the threats of today and tomorrow,” the chairman said. Dunford said his recent meeting with Russian chief of defense Gen. Valery Gerasimov in Baku, Azerbaijan, was a chance to keep the lines of communication open to minimize chances of misunderstandings between the two nations becoming incidents. The U.S. military cannot, by law, cooperate with the Russian military, he noted, but that does not and should not preclude communications. The chairman said that U.S. and Russian officials communicate at the purely tactical level to ensure there is no conflict between the two sides over Syria. In discussing operations against the Islamic State of Iraq and Syria, Dunford stressed that the 30-day review that President Donald J. Trump ordered is a political-military plan. “In the development of the plan, we have been engaged at every level of the State Department,” he said. The intelligence community and the Treasury Department have also been full members in forming the plan. The threat that needs to be addressed is not contained within Syria and Iraq, Dunford said, it is transregional. “In this particular case, we are talking about ISIS, but it’s also al-Qaida and other groups that present a transregional threat. When we go to the president with options, it will be in the context of a transregional threat,” he said. The plan needs to cut the connective tissue between the groups that now form the threat, the chairman said. “Then, working in cooperation with local and coalition forces, drive the threat down to the point where local law enforcement and security forces can deal with that threat,” Dunford said.